When the U.S. 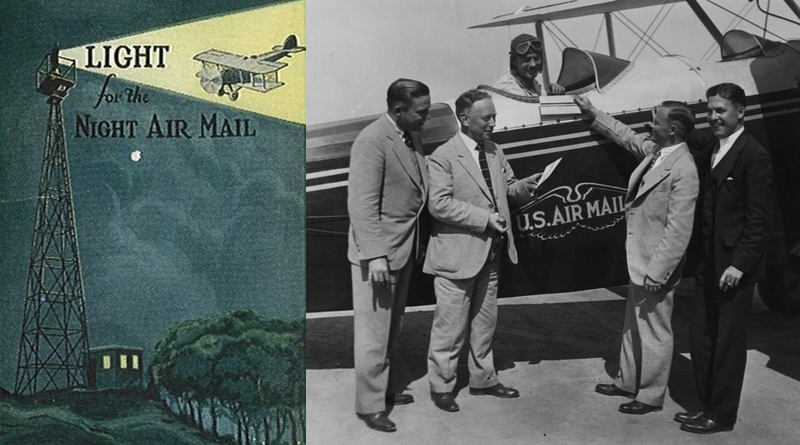 Postal Service opened up airmail routes during the early 1920s, many people saw it as a frivolous novelty. What good was sending mail by air? Sure, planes could travel faster than trains. But airplanes could only operate safely during the daytime, whereas trains could run all night. As a result, early transcontinental airmail delivery was a hybrid system. In 1922, letters sent by airmail would have to leapfrog the country, traveling by air during the day and by train at night. Using this process, a letter moving at its absolute fastest might take about 83 hours to get from New York to San Francisco. The few pilots who did try to travel at night during this time were taking their lives in their hands. Nearly 1 in 10 early airmail pilots died during the early days of the postal service's airmail initiative, and emergency landings were common. There had to be a safer way. Enter the highway of light — a system of airmail beacons that spanned the country. Built by the U.S. government, the airmail beacons of the mid-1920s helped pilots find their way much more safely — whether it was day or night. Spaced out every few miles, from New York to San Francisco, each site consisted of a revolving motor-driven light which sat at the top of a 60-foot tower. 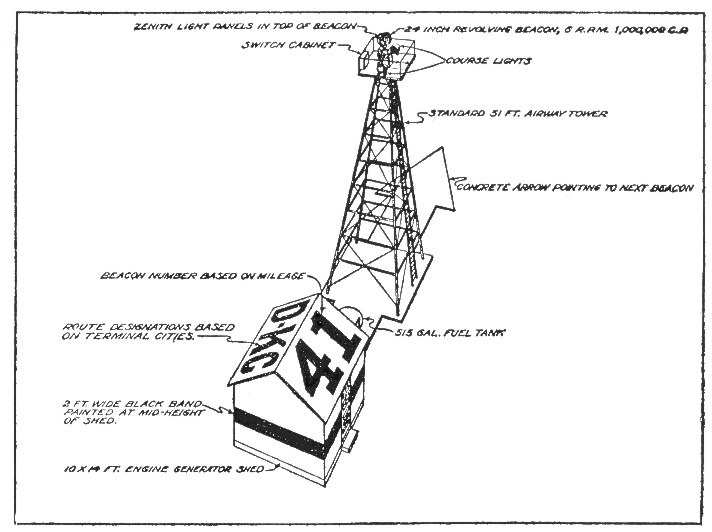 The 1931 illustration above from the FAA archives shows how the light tower sat in between a concrete arrow on the ground and a building that contained a generator, which powered the entire thing. Originally approved by Congress in 1921, the light beacon system was planned to cross the entire United States by mid-decade. Unfortunately, President Warren G. Harding slashed funding and the issue wouldn't gain steam again until the mid-1920s. Previously, the most reliable method of navigation for pilots was to use their old fashioned rivals as a guide; following the railroad routes ensured that they were staying on track. 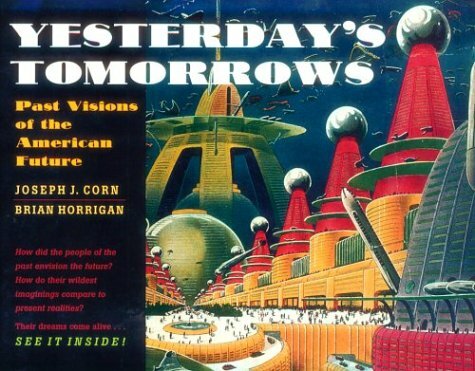 But this new system of towers — inland lighthouses with gigantic concrete arrows pointing the way — allowed air pilots to navigate without depending solely on yesterday's infrastructure. Once the new lighted airway was in place, that same letter that used to take 83 hours took just 33 hours to get from New York to San Francisco. 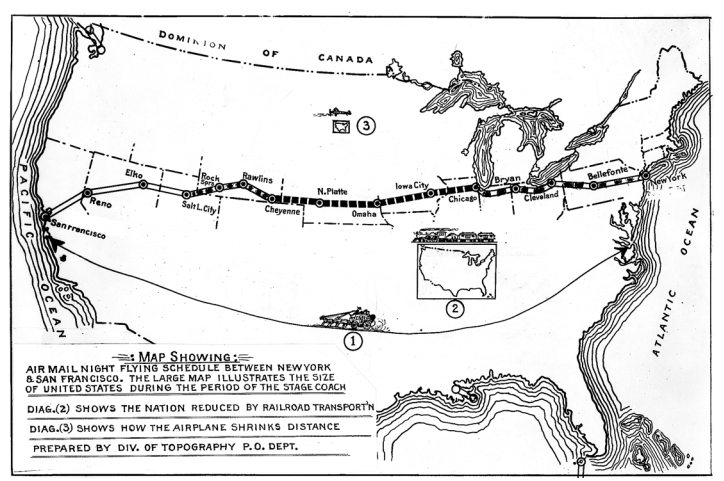 By 1926, the Transcontinental Airway System's light beacons were brought under the authority of the Bureau of Lighthouses and crossing the country by air (day or night) was considered much safer. These advancements also made the country feel that much smaller, as evidenced by the undated (circa 1925), map below which showed the size of the U.S. in relation to how mail was shipped during different eras. Upon completion of the system in 1933, there were about 1,550 light beacons stretching across 18,000 miles, guiding the way and pushing America into a new era of communication. Long distance telephony was expensive. And even though radio was all the rage — and fast becoming a coast-to-coast experience — sending a letter was still the most economical way to deliver any message among private citizens. On April 17, 1926 the mayor of Los Angeles sent the mayor of New York City an oversized letter proudly stating that it would cross the country in just 30 hours. Such a letter wouldn't have been possible without the new lighted airway system. Maintaining a network of light stations across the U.S. wasn't cheap. The October 1928 issue of Popular Aviation magazine laid out the enormous costs by looking at what it took to keep just one light station in proper working order. The beacon light (not including the tower it rested on) was $475, the automatic lamp changer was $50, the lamps were $6.50 (and only lasted for about 60 hours, tops), electricity to run it ranged from $50-$80 per month, $5 per month was spent for someone to maintain the station, and renting the land (usually from a farmer) was $5 per year. By Popular Aviation's estimates, it cost about $110 per month (about $1,500 adjusted for inflation) just to keep a single station in operation. With about 1,550 stations, that worked out to a budget of about $2.32 million (in 2013 dollars) per month. As planes got bigger and technology allowed for safer travel, the highway of light would become a relic. New air travel records were getting knocked down left and right. And the postwar explosion in aviation made city-jumping old hat. Today, the system's towers and generators are largely gone, leaving gigantic concrete arrows for bewildered backpackers to find. But these concrete ghosts — Jazz Age residue that lightly stains the American landscape — are a mere hint of the marvelous highway of light that guided daredevil postmen nearly a century earlier.